Look! Is that a mountain goat scaling that rock wall? Nope, just an adept climber well equipped from the local Mountain Goat Outfitters store! This is the climbers' climbing store. They talk it, they breath it, and they stock it. All the latest climbing gear is here along with hiking and backpacking equipment galore. Once you have the gear you have to have the right clothes. 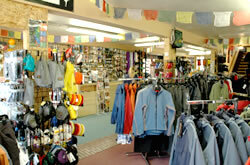 Not to worry, there is also a nice selection of men and womens outdoor wear ready for a quick try on. Great X-Counrty Skis for those blue X-Country skies found in our surrounding mountains! The friendly staff know their rocks as well as their stock. They will gladly send you on your way to the local climbing areas and hiking trails, well equipped for any challenge. Happy trails!